As I'm still playing catch-up with my posts, another two of my Fox in Flats style dare outfits from December. Also, my 2015 closet inventory and an invite for you to join the link up! The style dare for the dare was 'metallica' so I wanted to wear my cute little silver mini MAC bag, with this cute little cuff bracelet I won from a giveaway on Style of Sam. You can see a better pic of my accessories here on instagram. As it was another rainy and cloudy day, I decided to wear jeans. That was not a great idea as the humidity started to climb really quickly and I wished I'd worn shorts or a skirt instead! I did like the layering of the scarf and tank together though. Last worn: Alexander McQueen Roses skull scarf, Sass and Bide tank, skinny jeans, thongs, Rebecca Minkoff metallic mini MAC. The style challenge for the day was 'slick hair', so I used my hair straightener. Of course by mid-morning when I took pictures the humidity had gotten to it and it's not as sleek as it was at the start of the day, haha. I always feel like I've put a bit more effort into an outfit when I straighten my hair, as it takes a while to do. I don't do it as often as I used to now, partly because baby makes it hard to have enough time to get all 'dolled up' each day, and partly because I've gotten lazy and used to not doing it! I had some friends round for a little playdate with their son and baby T. Didn't quite work as their son is much older than baby T, although he did enjoy chasing Cooper and carrying him around and trying to carry baby T around too, hehe. I wore the bag and sandals for when I popped out quickly in the morning, but didn't need them in the afternoon when I stayed home. These sandals have never been the most comfortable when I wear them, and so this was their last wear to see if I would keep them. They are leaving my wardrobe, as the straps rub a little after a long period of wearing them. Last worn: Wayfarers, Jeanswest printed dress, silver sandals, Rebecca Minkoff Love bag. Ever since reading a list on a (now deleted) blog about how many items they had in their wardrobe, I've been thinking about doing a closet inventory of my own. I did attempt one a while back but after realising I had 50 dresses I had a little freak out over how much stuff I had and decided not to count the rest. As I'm being more open with my spending on the blog, I thought I'd finally count everything and be more open with the size of the wardrobe my shopaholic ways have resulted in! Not included in the count is things like trackie dacks, layering/breastfeeding singlets, oversized hoodies for walking the dog in winter, pyjamas, maternity clothes that only worked when I had a baby belly. That is the whole scary story. I know that 40 scarves is a lot, but honestly I thought it would be even more! It seems like an awful lot of maxi skirts, but I do wear them frequently. I'm amazed by how many tops I own, and jackets! Cardigans are something I can never get rid of - they aren't on the blog a lot as I usually just wear them in the office to cover up in the air con. I thought with breastfeeding I'd wear them more, and I did a few times in the early days when my 'uniform' was a cardi and singlet, but nowhere near enough to justify having so many. Still can't believe I have enough grey tees that I could wear a new one every day and not run out of outfits for two weeks! Eek! No wonder I have no room in my wardrobe....2015 will be the year of the wardrobe clean out, in earnest this time! I think the scariest part might be the fact that this is after I downsized from having an entire room for my clothes to having to squeeze everything into one wardrobe and a garment rack. 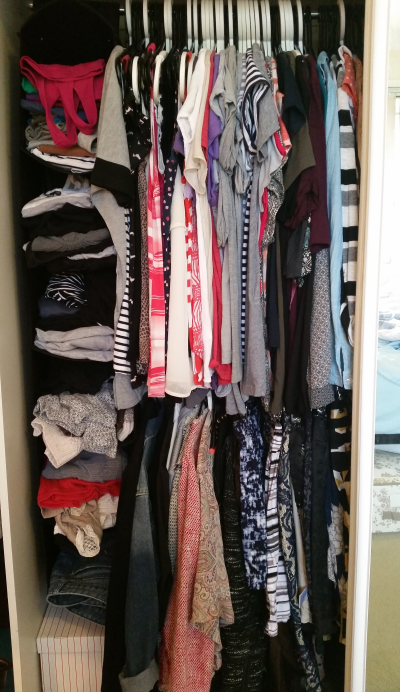 Have you done a closet inventory post? Or do you know how many things you own? Maybe you have a particular type of item you have a lot of that you're focusing on cutting down on this year? Tell me your numbers or link up your closet inventory posts below, I'd love to know! Linking up with What I Wore, Whatcha Wearing Wednesday, Style Me Wednesday, Trendy Wednesday, Thursday Favourites, Throwback Thursday, Spotlight Weekly, Passion 4 Fashion, Fab Favourites, Casual Friday today. Wow! you have a lot of stuff 40 scarves? that's a lot :) but if you love it gotta have more right? HAHA have a lovely day! Yes I have way too many things! Scary counting them all! this article is so useful, I should do the same. I read about an i phone app for this. I want to use it. Oh an app would be helpful! What's it called, is there one for android? Yes maternity leave is a great way to slow down spending, I've found that too haha! Plus your body is changing so much post-baby, clothes aren't the wisest of purchases :) Good luck with your clear out! Just love that first outfit, love the design in the shirt :) Both outfits are great though! WOW! You do have a lot in your closet! Mine is probably just as bad....if not worse. I definitely don't have as many scarves as you do, but I wish I did!! haha! haha yes it really makes me question my tendency to buy scarves..I already have so many how could I possibly need more?! Such stylish outfits! I love your Rebecca Minkoff MAC and that printed dress is so cute. It was fun to see your closet inventory! I need to go through my wardrobe soon! Love that silver bag! This sounds like a fun challenge. I have never done the slick hair look. It's always nice to get out of your comfort zone. Wow! I can't believe how many pieces you own. I would be afraid to know how much I own! I know, it's so scary! I definitely need to downsize, who needs that much stuff?! Ooh, I don't know if I dare to count everything! I admire that you did. I do cull regularly! Love that second dress on you - the shoes are great, but if they don't fit/rub, they have to go! I need to clean out more often I think! I have the shopping days sorted of course..haha! Well, I really like both looks - specially the layering of the scarf and the top. I think the closet inventory is a marvellous idea. I will try and count some things tonight. Will link it up as I do ! So glad you could link up Lorena, it's fascinating seeing your numbers as I've always admired your wardrobe :) You have great outfits! I love that print mixing in the first outfit mica! Looks so good and the touch of silver with the bag really sets it off. You know that's my favorite dress. Always looks so good on you! I love your inventory!!! I've cleaned out my closet (which I've been purging for over 3 years now lol) and recently my makeup. I may do a beauty inventory! I think it's a great idea so you can see what you have and that will dictate what you need. yes it's so helpful knowing exactly what I have..it shows me I don't need any more, haha! You have a lot of great things to mix and match. I like how a scarf can change the look of an outfit. I haven't been wearing them much as it's just too hot here for them this summer! Plus took a while to get back into them post-baby haha! I really love that printed dress! the print is so perfect and it fits you so well! And I definitely think your hair looks "sleek!" And I thought 25 scarves are too many (for me lol) haha! But no worries, if you do Hobeatly wear them and rotate them often, I don't see that's a "problem". As far as uncomfy shoes go, I would get rid of them too. Nothing bothers me more than having something doesn't work out. Oh but I don't wear them all regularly. I think I do have a problem haha! The metallic silver bag is such a standout, wow I just love it. I like the idea of a wardrobe inventory, I have often in the past wanted to do it but when I realise how much work it would actually be in never actually happens. I once counted something like 70 or 80 dresses and that really scared me (especially since I seem to wear the same 10-15 on rotation)…wow 40 scarves, I always knew your collection was impressive…and that sure is a lot of tops! Thanks for directing me to your youtube channel, I always enjoy your videos and must remember to subscribe later (as soon as I am not at work!). Also please let me know of any facebook groups you mentioned for Australian bloggers, would love to join. I am way to scared to do a real closet inventory! At last count, I had over 200 skirts and 150+ pair of shoes. I really would've thought you had more purses and shoes - you have such a great collection! I am not really a shoe person, so I don't have many. Although I think I still have a lot! I'm jealous of how many skirts you have, wow! that's a decent collection there mica ;) i'm curious about my closet now that i've read this. i don't know yet if i am brave enough to count! i probably have more than 14 white tees/tanks though, i think it's ok to have a solid wardrobe staple to depend on! that's what I'm telling myself, maybe I need to wear them more to make them the wardrobe staple I say they will be when I buy them though, haha! I think that doing an inventory like this one is a great idea...the best way to really know what is in our closet. Love both of your looks...the first top is so lovely...great look. The second outfit I also really like...the dress is perfect and so well accessorized with that necklace! You have 138 tops?! That's crazy awesome! I wish I had that many. Definitely something to strive for. It's faaaar too many! I need to cut down, drastically! I have no idea how much I own, just that it's too much. I know I just took out a dozen things and you would never know the difference. I know I need to try harder to pare down, but it's easy for things to get out of hand pretty quickly. My white tops are much like your grey tees. Love the silver Mac, and your printed black and white dress is so pretty! haha yes you can never have too many! And then you count them and feel bad...I need to pare down a lot more I think! I love that first look! I remember liking that Sass & Bide top when I saw it online somewhere, ha ha. Sadly it was too much for me! And that second look is too cute! It is scary counting! makes you see just how much, big numbers! I really liked reading your post! I don't think I could do a 10 item wardrobe...but I do definitely need to pare down the size of my wardrobe! I've never done such a closet inventory, but it's a nice idea! Wow good for you for doing this!! I am such a scarves person as well and I don't even want to count them. I never thought of doing a clothing inventory before. You look adorable in both these looks, love that dress and the necklace!! Have a great weekend. I am definitely a scarves person, I think I need to re-think that and be more of a scarf wearer and less of a buyer after seeing the numbers, haha! I've tried one-in-one-out before and not gotten far with it, but I am definitely seeing now I have soo many things I should start thinking more that way! Great post! One can never have enough scarves in my opinion, they are the perfect accessory! Thank you for joining the Trendy Wednesday blog link up. There are so many different patterns for scarves and colors and sizes for bags, you can never have enough! It's always so interesting to see what other bloggers' closets numbers are. I should probably clean out my closet more, but I like most of my items and wouldn't know what to get rid of! It's so hard trying to see what to get rid of, I'm trying to wear more of what I own and we will see if I manage to reduce the size of my wardrobe that way, by getting rid of things I wear that don't feel right. Slow process though! Ooooh this is such a good idea!!! I'm excited now! By the way, I love your blog -- I've popped in and out for a while but only recently read your 'about' section; I love that your goal is to focus on and highlight what you can wear from your own wardrobe in everyday life. Thanks for visiting me! Thank you! I'm trying to wear more of what I own so that I have a reason for keeping it all, I have too many 'just in case' pieces! Plus it helps me to get rid of things when I wear them and they don't work I can donate them! Absolutely love the second dress, love the boho-inspired style! I know i have too many! I can never seem to part with them though, that's the problem! Must be more ruthless! :) And I'll always post here when I do an ebay clearout, might have to do one again soon the donate pile is growing larger and larger! Your outfits from the top are lovely! I'm jealous pf your warm weather. I could use a bit of that right now! I did a closet inventory last year. I need to do it again for 2015. I find it fascinating what other people have in their closets. Such an interesting post!